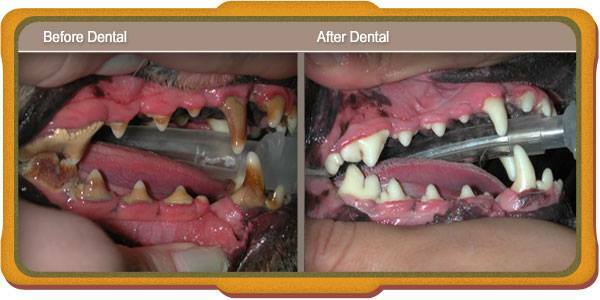 Dental Cleanings are a necessary part of maintaining overall pet health. There are many factors that affect how often your pet will need a dental cleaning. Obviously genetics plays a large role in variables like the pH of the saliva, but how often your pet has their teeth brushed or how much chewing your pet does plays a large role too. Teeth are the foundation for overall health and are one major factor of your pet’s health that can be completely controlled by teeth brushing at home and dental cleanings at our office. Plaque. Largely bacterial in nature, it forms within hours of normal teeth brushing. Tartar or Calculus. Mineralized Plaque that most clients associate with bad breath and the discoloration of teeth. It is usually formed in layers and will not come of with normal teeth brushing. This is the best time for dental cleanings because there is no gum disease at this point. Gingivitis. This is an inflammatory process caused by the chronic accumulation of tartar. Owners might see a small amount of blood left on a bone or chew toy after their dog has finished chewing, this is a result of gingivitis. At this stage, the disease process is reversible with a dental cleaning. Periodontitis. This is the end stage of dental disease if all of the above is left untreated. The inflammatory process now has spread into the connective tissues and will result in bone loss that will cause the tooth to become loose and eventually fall out or be extracted. All of this process is associated with a painful mouth. Chronic plaque and tartar can affect not only your pets teeth and gums, but their overall health. Gingivitis along the gum line will cause bleeding that can allow bacteria into the bloodstream and can serve as a source for infection to the kidneys, liver and heart valves. Regular dental cleanings and preventive care can support the health of your pet and promote them to live longer lives. Poor oral hygiene can lead to periodontal disease, tooth loss, and other serious health problems, such as heart valve infections, liver, and kidney failure.